Michael "PUNKY" Koch: Maurine...Maurine...Maurine! Shoot me!!! Well the salon I am working at is an AWESOME place and I love the people I work with and it is usually peaceful as you can see. 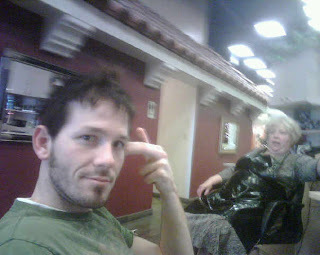 The girl to my right is rarely ever there and I love her to death, and the girl at the station to my left is my best friend at the salon BUT....its not always so awesome....... There is this lady named Maurine who claims to know everything and she of course has to tell you about it. There is one cool thing about Maurine because she used to know Grandpa Eddie back in the day and actually wanted to work for him, but lets just say she is a little CRAZY!!! -tries to set me up with every one of her clients that is single. -likes to tell me how much things cost back in the day. -she wears the same dress every single day. -tries to get my clients to date me. If you notice in this picture she is talking but doesnt even realize that I am putting a gun to my head wanting to get myself out of the conversation very quickly......she has been there for 30 minutes!!!! Well one day when I open up my own place I wont have a Maurine to bug me.....hahaha Well I hope not anyway. 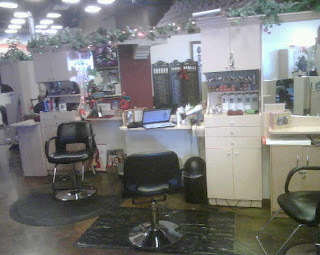 Here is one of my salon ideas that I have. 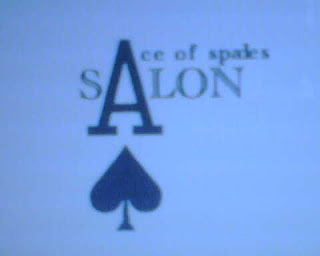 The Ace of Spades Salon......just an idea floating around. Dangit! You don't know how to do perms? I was hoping you'd be able to give me one in time for the holiday season. It was going to look great with my beautiful rudolph sweater. Hmmm...maybe next year. Mom told me about crazy lady. I'm glad I got to see a picture of her. She's hot! Wow, Michael! I guess I've been out of it. You've really been keeping up your blog lately. So fun to read about the ups and downs of your life. I'm truly impressed you're cooking. We'll be waiting for dinner at your place one of these days. As for Maurine, everyone needs a character in their life...even if it's an annoying one. Keeps us all human, alive, and kicking, don't you think? I was telling my hairdresser friend in our ward about the perm comment. Her look was priceless. And to think I was about to ask you to give me a perm! Guess I'll just have to ask Maurine to do it since she's up with the times. You really should get with it!